Lincoln Property Company will be hosting its annual Communities for the Cure Day on Friday, October 18. Employees, residents, and anyone visiting a Lincoln Property Company office or community on that day, is invited and encouraged to “Celebrate Pink”! Show your support and help raise breast cancer awareness by proudly wearing pink during Communities for the Cure day! This will be the 3rd annual Lincoln Property Company Communities for the Cure day. Each year, employees and residents alike show support, share hope, and raise awareness of breast cancer by wearing pink and hosting various community events. To help further awareness, employees are encouraged to take team photos and share on Facebook, Twitter, Pinterest, Instagram and Foursquare using the hashtags #celebratepink and #communitiesforthecure. 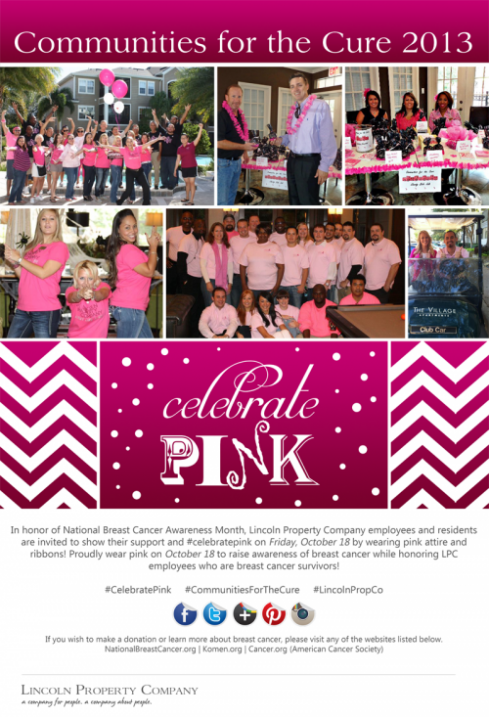 If you live or work in a Lincoln Property Company managed community, remember to “Celebrate Pink” on October 18 and share your pink photos!